A few years ago, a group of engineering students at the University of Waterloo found something problematic with sunscreen. It worked well if used properly but there was one problem: it was impossible to do so. This group of students developed a product that, once applied to the skin, will change colour once sunscreen needs reapplying. When asked how the team came up with the idea for Suncayr, CEO of Suncayr and University of Waterloo alumni Andrew Martinko said, “the idea came from brainstorming problems the team was facing”. Using the help of programs like Velocity and the Conrad Center they created Suncayr, a company whose mission is to protect its customers from the harmful effects of the sun. This Waterloo start-up just added 43North, a start-up competition in Buffalo, to its list of funding achievements. From it’s performance Suncayr received $500,000 and free incubator space in Buffalo, New York to aid in growing their company. The win is not the first for the startup who have been wining awards of increasing size since their foundation. Imprint asked the Andrew Martinko some questions regarding the fresh funding and Waterloo’s influence. He was excited to use this funding to bring on “new talent” for their upcoming launch in Australia as well as the North American launch in summer 2018. Martinko credited the university and related programs like Velocity in their success for providing the mentorship and resources when the company was initiated. He also said that while the funding was tight in the Waterloo region, beginning here only helped them move forward as a company and that they plan to build on their local presence in the future. The Waterloo environment may not have been the best for funding, but the team likely benefited from the startup friendly environment of UW. The string of success stories that emerge from the university combined with strong encouragement from staff leads to a higher than normal amount of new ventures. It seemed also as though there is serious possibility for Suncayr to branch out into other product fields not just limited by their relation to the sun. Martinko said he wants their brand to be “associated with trust,” and any future product from Suncayr is a product you know has been tested thoroughly. They are likely banking on the success of their product at scale in order to help convince customers of this fact. In a closing message, Martinko wants to make sure students experience everything University of Waterloo has to offer outside of academia. Connections with the variety of on-campus resources have helped the company in a variety of ways. 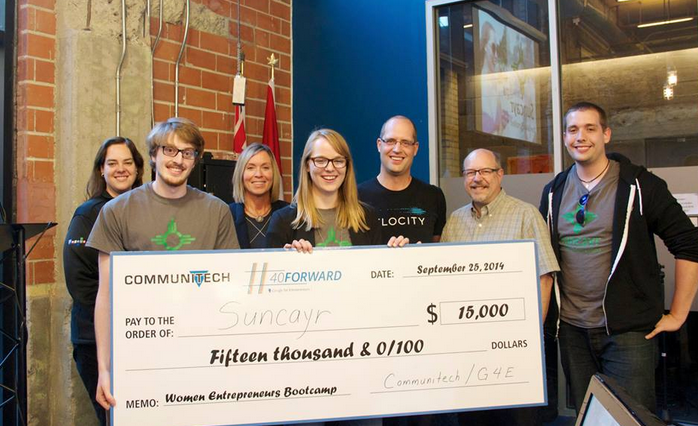 Being a group of engineering students with no formal exposure to running a small business, the Suncayr team benefited greatly from the advice of mentors from Velocity and Conrad. Whether it’s sports, an entrepreneurial club, or a science club Martinko said that is where you meet the people you’ll know for life, or start a business with.